Oxford Shakespeare Topics provides students, teachers, and interested readers with short books on important aspects of Shakespeare criticism and scholarship. Each book is written by an authority in its field, and combines accessible style with original discussion of its subject. Notes and a critical guide to further reading equip the interested reader with the means to broaden research. The history of the genres, or kinds, of drama is one of contradictory traditions and complex cultural assumptions. The divisions established by the original edition of Mr. William Shakespeare's Comedies, Histories, and Tragedies (the First Folio, 1623) give shape to whole curricula; but, as Lawrence Danson reminds us in this lively book, there is nothing inevitable, and much unsatisfying, about that tripartite scheme. Yet students of Shakespeare cannot avoid thinking about questions of genre; often they are the unspoken reason why classrooms full of smart people fail to agree on basic interpretative issues. 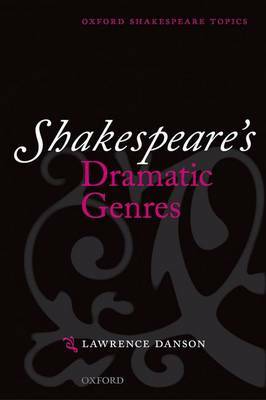 Danson's guide to the kinds of Shakespearian drama provides an accessible account of genre-theory in Shakespeare's day, an overview of the genres on the Elizabethan stage, and a provocative look at the full range of Shakespeare's comedies, histories, and tragedies.